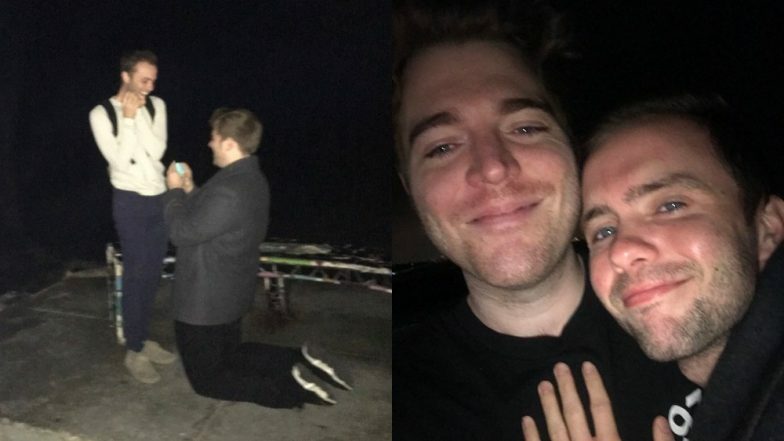 YouTuber Shane Dawson Engaged To Boyfriend Of 3-Years, Ryland Addams - View The Cute Post! The proposal took place on a beach lookout point n the night. Post the proposal, Dawson and Ryland both took to their respective social media handles to spread the news. While flaunting his new ring, Shane and Ryland are seen kissing in their post-proposal pictures. Dawson further added a tweet about his engagement and wrote, "THIS IS THE BEST NIGHT OF MY LIFE AHHHHHHHHH!!!! THANK U GUYS FOR ALL THE LOVE MY HEART IS LITERALLY GONNA EXPLODE 😭❤️❤️❤️❤️❤️❤️❤️❤️❤️💥💥💥💥💥💥💥" Ryland too expressed his joy over the engagement as he wrote, “We’re engaged!! I can’t wait to spend the rest of my life with you❤️ I’ve never been happier in my whole entire life.” check out their posts below. we’re engaged!! I can’t wait to spend the rest of my life with you❤️ I’ve never been happier in my whole entire life!! Interestingly, Shane proposed to Ryland on their third anniversary! Talk about a good gift, the diamond ring sure takes the cake! Taking to Instagram, Shane had said how the three years have been his happiest all thanks to boyfriend Ryland on his Instagram anniversary post. “Ryland, thank you for making the last 3 years the happiest time of my life. Thank you for sleeping next to me even though i sweat through the sheets. Thank you for making me smile and reminding me how loved I am in real life even when I’m being cancelled online,” wrote Shane. Before Ryland and Shane began dating in 2016, the YouTuber was engaged to Lisa Schwartz, another YouTuber. The two dated in 2011 but ended their engagement in 2015, the same year when Shane came out as a bisexual in a YouTube video.